What is Pluto? A planetary eccentric? A Kuiper Belt object? A binary? A dwarf planet? It is, of course, all of these – and much more. For the New Horizons team, Pluto is "king of the Kuiper Belt," the leader of a complex tribe of moons, and a beacon to an unexplored solar realm. For many visitors to this site, the story of Pluto's discovery is familiar. Pluto's discovery in 1930 was also the discovery of the Kuiper Belt, although this was not truly appreciated until the 1990s. For years Pluto was viewed as a lone oddball beyond Neptune, even though it is a commonplace of astronomical practice that once you find something new, it is probably the harbinger (if not the most easily spotted) of many discoveries to come. Pluto did turn out to be the brightest of the Kuiper Belt objects (KBOs) in terms of apparent magnitude — due largely to its frosty, and hence reflective, surface and the fact that, for the moment, it retains its title as the largest of the dwarf (or small) planets. Size does matter for planets, and Pluto's size is sufficient for it to retain an atmosphere, and implies the likelihood of geological complexity. Plus there are all those moons, from massive Charon to the extended family of Styx, Nix, Kerberos and Hydra. And how many more will New Horizons find this year? The richness of the Pluto system, and the evidence for time variation of its atmosphere and surface frost and albedo patterns make Pluto the most clearly fascinating of the all the KBOs. We humans would want to visit Pluto out of scientific and cultural curiosity regardless. 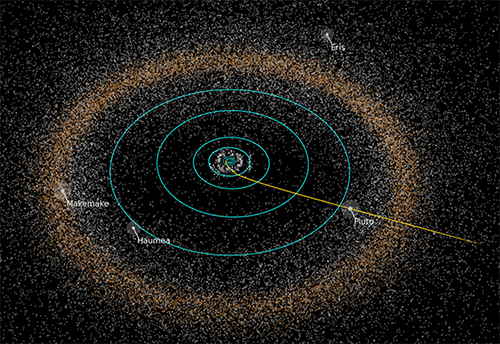 But it is Pluto's context in the Kuiper Belt, and what the Kuiper Belt — the solar system's third zone — implies for the formation and evolution of the entire solar system, that drives the New Horizons mission. While the Voyagers, and Pioneers 10 and 11 before them, passed through the Kuiper Belt, they did so blissfully unaware of the worlds therein. New Horizons is humanity's first mission dedicated to exploring trans-Neptunian space as a place. On tap is a visit to not one or two, but six individual objects in the Kuiper Belt—Pluto and its five moons. And if NASA approves, New Horizons could visit an entirely separate KBO later this decade. We know relatively little about the worlds of the Kuiper Belt, compared with the terrestrial planets or the gas and ice giants (the first and second zones), and we have never surveyed any object in the Kuiper Belt close up to see if our painstakingly derived inferences are on the mark or not. 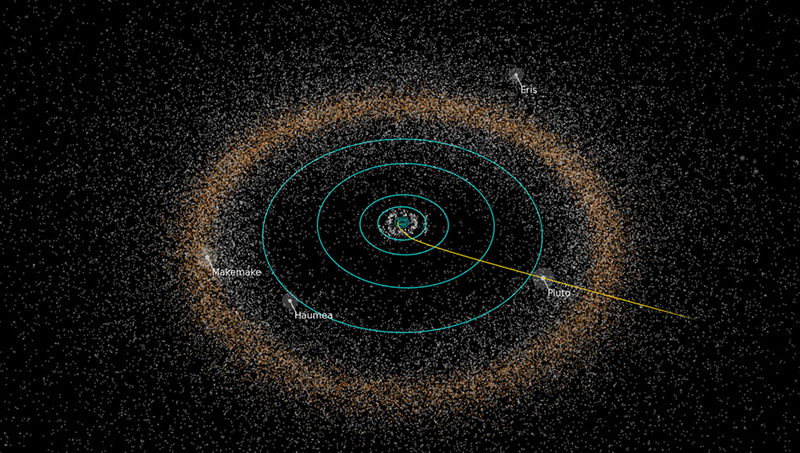 The Kuiper Belt is a vast reservoir of bodies both ancient and evolved. Nearly 2000 KBOs are known, but the actual projected population is much larger, perhaps 200,000 bodies of 100-kilometer diameter or more, and with a combined mass of 0.05 – 0.10 Earth masses. Furthermore, the Kuiper Belt is not simply some shapeless dumping ground for solar system leftovers. It is highly structured, sculpted by gravity, and beautifully so. Some KBOs are indeed frozen remnants from the formation of the solar system, and contain clues to the conditions in the solar nebula at a distance of 45 astronomical units or so from the Sun. Most KBOs, however, are immigrants or transplants from closer in, and this includes Pluto-Charon. This is probably the most amazing aspect of the Kuiper Belt, and the most profound. Pluto and Charon probably formed somewhere in the region between 15 and 35 au, a zone that overlaps the present orbits of Uranus and Neptune. Our best theoretical ideas have our solar system forming in a much more compact configuration, with all the major planets inside 15 AU and surrounded by an outer disk of planetesimals and dwarf planets. Such a configuration is only conditionally stable, however, and when a resonant instability strikes the giant planets, Uranus and Neptune are both flung and then evolve outward, scattering the planetesimals in that disk, but also capturing them and releasing them gravitationally. Some readers may know this as the "Nice model," but it is more than a specific model, it is a conceptual framework that threatens to make sense of early solar system history. And the most telling evidence for its reality is the Kuiper Belt itself. The details of Pluto's formation, the formation of the Pluto-Charon binary, and its installation into the 3-to-2 mean-motion resonance with Neptune are subjects for later columns. But I would argue that, if one focuses just on our own solar system (as opposed to, say, exoplanets), the revelation of the Kuiper Belt is the most significant advance in planetary science in the last 30 years. We choose to go to Pluto and the Kuiper Belt to deepen our understanding, and to unlock the secrets, of the third zone. William McKinnon is a New Horizons co-investigator from Washington University in St. Louis. His research focuses on the icy satellites of the outer solar system and Pluto of course! He is a deputy lead for the New Horizons Geology, Geophysics and Imaging Theme Team, and is particularly interested in the origin and evolution of the whole Pluto system.